My favorite part of auto shows? Giving Bib a hug. Planning on attending the Detroit Auto Show this year? Good! Whether you attend because you love checking out the new cars, are the Mom of car-loving little people, or are making up for forcing your husband watch the Twilight Saga, you are bound to enjoy the 2013 North American International Auto Show (NAIAS). Plus, Detroit needs every bit of patronage it can get, so your visit counts as a good deed as well. Win-win! Cobo looks great: revamped Cobo Hall looks (and smells) better than ever. You will be pleasantly surprised by the state of the facilities and plentiful food choices. 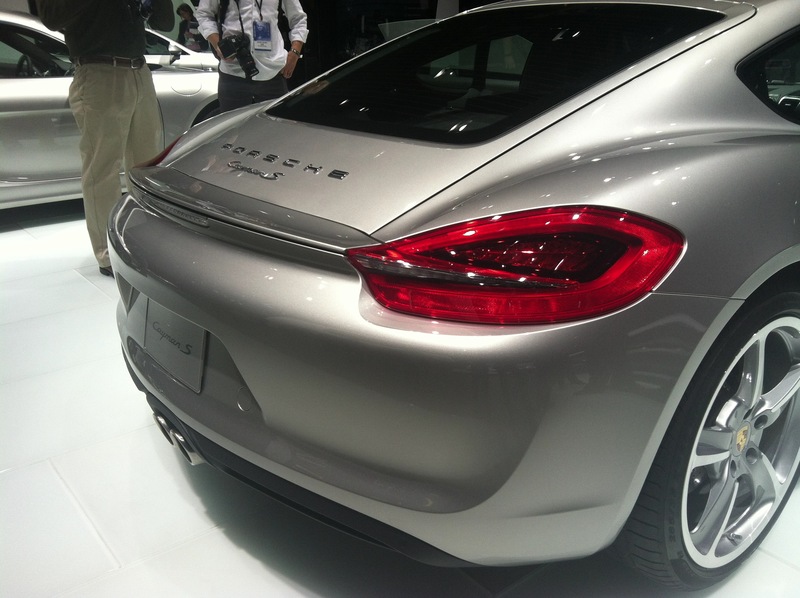 I’m also in love with this Cayman S rear end…just look at how the spoiler blends beautifully into the rear lights. Ah! Like sportscars? You’re in luck: this is the year for good looking cars. Even if an Audi RS7 is not in your future, being able to look at it up close is a blast. I still get all giddy when I approach the Porsche Boxster S, even though I have driven it for a review. The Porsche exhibit, with its elegant display of various Porsche models in silver, will inspire you to look past the brand and into the details of each car–and details is really where it’s at. Whatever your favorite make (yes, yes, the new Corvette Stingray is there too, and you can get up close), you’re bound to have a great time. Like F1 cars? There are 2 at NAIAS. When we visited, Sebastian Vettel‘s RB6 and Fernando Alonso‘s 2012 Ferrari were on display. For those of us who follow F1 and cheer for either of these drivers, seeing these cars up close was nothing short of exhilarating. Bonus: Seb’s driver’s suit, shoes and helmet were on display (thankfully behind glass, or it may have been too tempting for this Red Bull Racing fan). 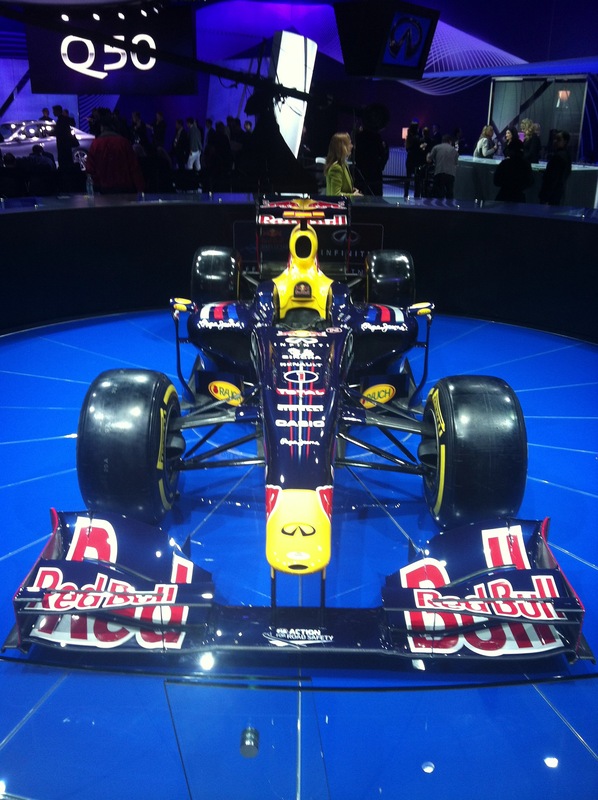 Sebastian Vettel’s RB6 at NAIAS. Looking for a family car in the next year or two? The auto show is far better than the dealerships to do some preliminary reconnaissance of possible family cars. There are many makes and models of family-ready cars at the show, so that you may find you gravitate toward an unexpected choice after seeing it in person. Granted, you will only be able to look — not drive — but you may still find yourself looking at a choice you didn’t previously consider. And speaking of family cars, Maserati did unveil their new Quattroporte last Monday, so if you’re shopping in the mucho dinero price range, go check that one out. Electric cars: once the stuff of futuristic daydreams, electric and hybrid cars are popping up everywhere and in all price ranges. Granted, electric vehicles are nowhere near mainstream still — but it is encouraging to see that so many manufacturers are taking alternative options more seriously. Even if you have zero interest in cleaner energy, you are bound to enjoy seeing what could be the cars of the future. Check these seven electric car models out. 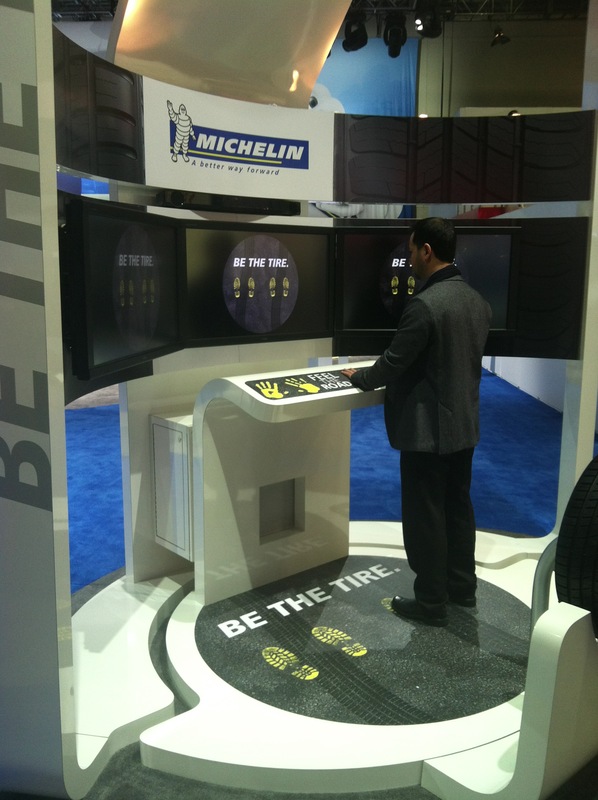 Michelin’s “Be The Tire” interactive display helps attendees learn more about tires. Learning tools: I love driving simulators and all sorts of interactive displays that help me understand cars and how they work. By far, my favorite interactive display in this year’s NAIAS was the Michelin “Be The Tire” display, where, via your hands and feet, you can feel what a tire feels in various conditions, from gravel to snow. Check this one out, and have your teenaged drivers experience it, as well. You’ll be a better (and safer) driver for it! Parking has been confirmed to be an absolute nightmare by many in various roles and levels of importance. When we attended on media day (Monday), all the COBO garages were inaccessible and all surrounding garages sported “monthly parkers only” signs. As a result, I got an involuntary tour of the surrounding areas as I attempted to find a place to park. Total travel time: 45 minutes. Total parking time: 35 minutes. Ugh! Save yourself the hassle and park at Joe Louis arena, or enter the city from anywhere but M10. And keep about $10 handy for parking costs. 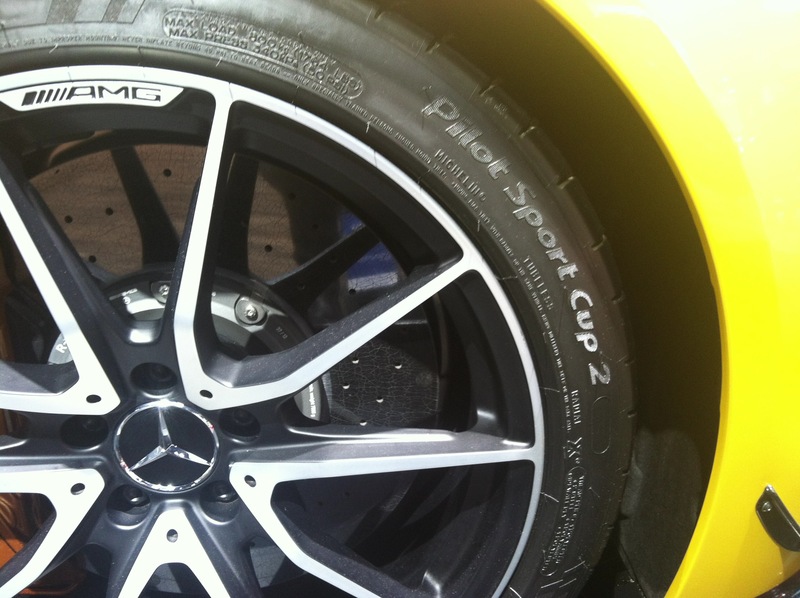 Great car, awesome Michelin Pilot Sport Cup 2. Too bad the Mercedes booth person was so unfriendly. Snobby attitude: snob of the day award goes to the Mercedes booth woman, who couldn’t manage to be friendly under any circumstances. Note to luxury brands: reinforcing your potential customer’s concept that you are a snob brand does not add prestige to your vehicle. If Hurley Haywood can take a moment to talk to folks perusing various Porsches without being stuck-up, so can you. If the people at Ferrari can share my enthusiasm in seeing their F1 car, you, too, can treat a blogger nicely. 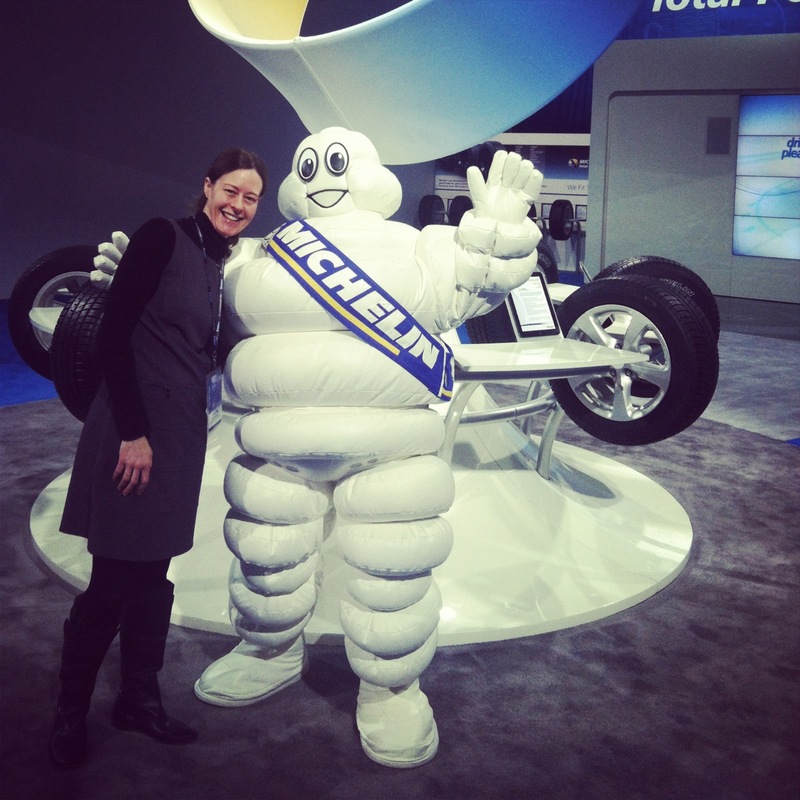 My aching feet: I have been known to make poor footwear choices, and such was the case when I attended NAIAS. I suggest that you throw fashion out the window and wear your most comfortable, most forgiving shoes this weekend. Your feet will thank you! Have fun and let me know what your favorite part of the North American International Auto Show was! 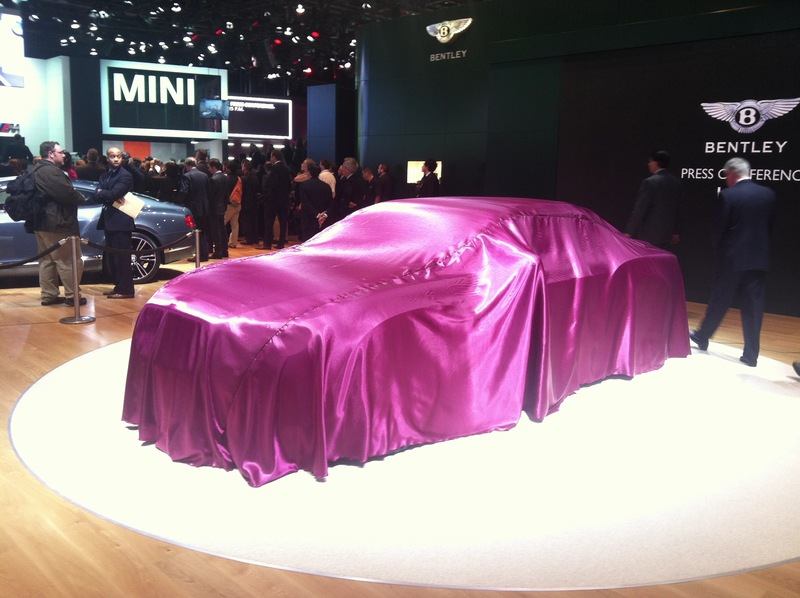 What was Bentley thinking when they covered their new car in fabric resembling cheap lingerie? You decide.